For a special business dinner we dined at Italian Village in the City Centre Chicago for a classic Italian wine and dine experience. 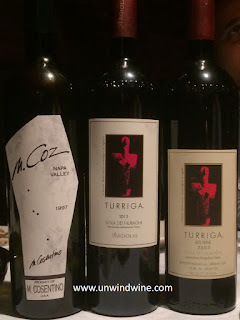 Wine Director Jared Gelband pulled from the IV extensive wine cellar two vintages of this unique Italian varietal label for a mini-comparison tasting - 2003 and 2013 Argiolas Turriga. For an old world vs. new world comparison tasting Jared pulled a 1997 vintage Napa Valley Meritage Bordeaux Blend from Napa Valley, Consentino M. Coz. Both labels were great complements to our varied selections of classic Italian cuisine. The Argiolas brand consisting of ten different labels is one of the most popular and widely distributed brands from the Island of Sardinia. Turriga is a blend of native Sardinian varietals - Cannonau, Malvasia Nera, Carignano, and Bovale Sardo, and is considered a benchmark red wine showcasing the best of Sardinia. It has been produced by the Argiolas Family and Giacomo Tachis since 1988. The brand is named for the family patriarch Antonio Argiolas, who was born in 1906. He was the first to plant vine rows to join vineyards together, and strived for the highest possible quality in his winemaking in this label. His two sons, Franco and Giuseppe took over the business with their wives, Pina and Marianna, and then with their own children. 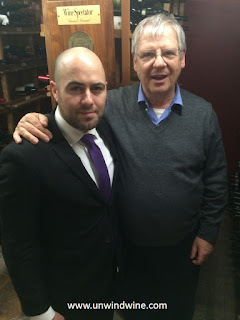 Today, the Winery is run by the third Argiolas generation: Antonio’s grandchildren. The impetus for this flagship label was to create a great Sardinian wine capable of long aging using only Sardinian varietals. It is aged two years in French barriques. It is named for The Venus or "Turriga" that graces the label that was found in the vineyards of Argiolas back in 1935. The estate is on the Island of Sardinia in the middle of the Western Mediterranean, facing south looking across to Africa. The total Serdiana estate has about 40 acres of vines in the Sibiola countryside, in the Municipality of Serdiana with another 90 acres of vineyards in the Parteolla area, on hilly land at an elevation of about 1000 feet above sea level. The Turriga vineyard is comprised of 15 acres of wines sitting at an elevation of 750 feet overlooking the Mediterranean to the southeast towards Africa. It was first planted in 1970 and was used in the first release of this wine in 1988. Today 50,000 bottles are produced per year. Turriga is a blend of Sardinian grape varietals Cannonau, Malvasia Nera, Carignano, and Bovale Sardo. It is a powerful fruit forward red wine that requires time in bottle to show its full complexity. Upon release, Turriga is densely packed with powerful tannins and tightly wound fruit, thus decanting is recommended. With time in bottle, Turriga reveals multiple layers of Mediterranean herbs, roasted coffee, spices, and licorice with a generous core of black and red fruit. Both were bright ruby colored, medium full bodied with bright, vibrant, bold and expressive forward sweet cherry and black currant fruits. The 2003 was a bit more subdued, more polished and balanced, more complex with the fruit less obtuse and more integrated with notes of earthy spice, herbs and leather, bright acidity but moderately smooth tannins. RM 89 (2013) and 90 (2003) points. For a comparison of old world vs new world, Jared presented this Cosentino Winery M. Coz Napa Valley Meritage Red from the classic 1997 vintage. Meritage (rhymes with heritage) is the name given to a US wine comprised of the Bordeaux varietals, hence a Bordeaux Blend. Meritage is a trademarked name and accordingly licensed from the Meritage Society. The 1997 vintage of Napa Valley Cabernets was much heralded and expected to be long lived vintage of highest quality. Many of the '97's have been confounding being closed and subdued in revealing their true potential. Some believe its still aging gracefully, yet to emerge to reveal its true greatness. I'm holding off judgement, standing the belief that perhaps the vintage was over-hyped and may be just so. I've been wrong in such matters before and look forward to being proven so if my extensive collection of '97's start to awaken. Tonight this '97 was showing well revealing bright, vibrant black berry and black current fruits. Dark garnet colored, medium full bodied, the fruit was accented with tones of cedar, tobacco leaf and hints of sweet oak and dark mocha, turning to a moderate, soft tanning finish.